Visagist using brush close up. Face makeup, bright colors. 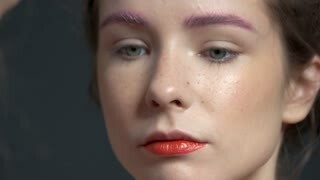 Visagist using lip brush. Female face, beautiful makeup. Visagist applying eyeshadow close up. Girl having makeup done. Brush applying eyeliner close up. 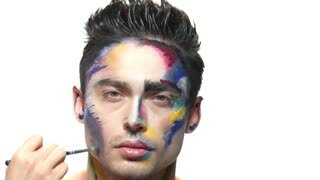 Work of visagist, colorful makeup.